For the longest time that was the definition of” “marriage” for me. I can’t explain it, I say. My sister says, There were shops. You could have bought some. I can’t explain it, I say again. I didn’t wear any. I wasn’t happy about it. It’s just the way it was. Why, why, why, asks my sister. How could you have gone out into the street in a miniskirt? How could I have done it? It gave me a focus. Instead of thinking about how I had no education and no job ex­perience and couldn’t type and had no husband and three kids and no future that I could even begin to imagine, in­stead of that I could focus on Jeez here I am with no un­derwear again. Better stand up straight. Maybe I Just wanted the attention, like a six-year-old who knocks the lamp off the table while his folks read the paper. Very childish. I agree completely. How about that? Does that hold water? My sister shakes her head. No, she says, but her voice is patient. What do they want, she asks, those young girls who are so promiscuous? Yes you do, says my sister. What are they looking for? Yes you do, says my sister. Right, says my sister. That’s right. Looking for love in all the wrong spaces? I say, laughing. And that’s all they think they have to offer, says my sis­ter. You have to say that. But of course, I say. That’s so obvious. Well you have to write it, says my sister. Okay, I say. I will. I went around with no underpants. It was like a big advertisement. Here. This is all I have to of­fer. Check it out. And everyone who showed any interest I followed home. There. Are you satisfied now? I remember one summer I was slim enough to wear a yellow polka-dot two-piece bathing suit, and still, I could see him looking sadly down the beach like a dog on a rope. No matter what, there was still only one of me. Which later he regretted taking so long to find out. What is this, my sister asks again. It’s an explanation, I answer. It’s an apology, I say. It’s a present, I say. You died, and the past separated itself from me like a con­tinent drifting away. Like a trick floor. Somebody has tilted it and I have slid into the new year but you remained behind. Last night I dreamed you’d moved to California and I’d forgotten to get your number. Forgotten to call you. I was just starting to make a few inquiries when suddenly you returned, thinner and happy. I was glad to see you looking so well, although I worried about the weight you’d lost. “I’ve been trying to call you,” I began to say. “I’ve been home all along,” you said, “although last night might have pre­sented problems.” By which I knew you had fallen in love with somebody. You were so calm. And then this morning your ashes are still here, in a box on my bookcase. You had a certain way of saying my name. It was the in­flection maybe, something you put into those three sylla­bles. And now you are gone and my name is just my name again, not the story of my life. All good! However the last one, “My Name,” the shortest, spoke volumes. Wow! A new writer (to me) to investigate! A powerful—yet understated—way with words. Wow! A new writer (to me) to investigate. Understated but powerful. Loved it, with her no holds barred attitude this book touchs the deepest part of the heart. I confess to thoroughly enjoying this piece. Simple but poignant language captures the magic of the ordinary in carefully framed gems. This one’s a keeper. Thanks. One syllable — It wasn’t the inflection; it was the love! This poet’s work caught me and quieted me until I could hear everything she was feeling when she wrote it. I’d love to have a collection of her work! 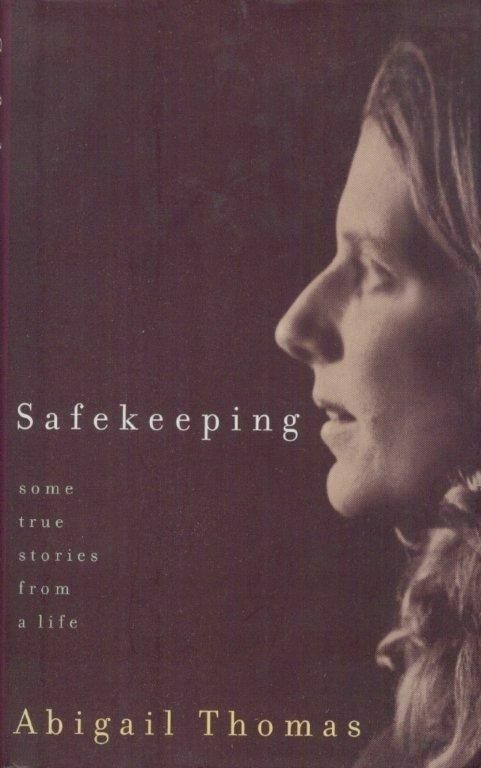 “Safekeeping” is exactly that. A book, an author, a haiku-like narrative driven by laughter, love, the beauty of moments, the every-dayness of self and wonder (husband/wife, divorcee, widow, mother, grandmother, lover, etc.) the reader finds himself returning again and again for the purity of passages that make life sing. “True Stories” indeed. The beauty of moments sums up Abilgail’s writing exactly. Her words inspired me to a write a poem about my children arriving from all directions to surprise me on Mother’s Day.